A lot of people will claim that babies are "too small" to play with toys. I believe that teaching babies to interact with objects within their environment aids in development of gross and fine motor skills, as well as advancement of hand-eye coordination, boosts language skills, reinforces the idea of cause-and-effect, and teaches the simple concept of social interaction. Here are a few toys and devices that have proven to be tried-and-true. I was SO EXCITED to get this toy when I put it on our registry. It was one of the gifts from my two best friends, and who were looking forward to seeing Lucas' face light up at his first bath with it. 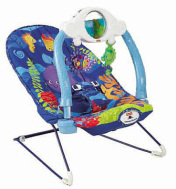 You can get it at Target or Babies R Us. It worked okay the first time I used it. The bubble solution that came with the machine was stinky, and only made teeny tiny bubbles. I made a mixture of baby soap, thinned with water, and that seemed to work equally as well. 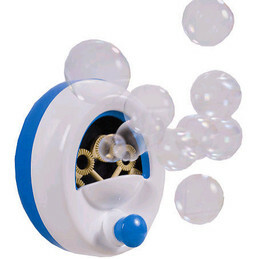 After about the second use (even with fresh batteries), the machine wouldn't "blow" the bubbles with enough force to cause them to exit the machine. So I had a bunch of slimy bubble goo running down the side of my bath tub, making it slippery and causing a falling hazard. The batteries ran dead within three uses, but the chamber was still full of soap. You can't submerge the device in water, making it exponentially more difficult to change the batteries. Lucas still loves the machine, and doesn't mind the bubble goo running down the tub, so I just place the machine on the inside shelf of the tub, and let him go to town playing with the bubbles.